← It’s old, it’s cast iron, it’s green, it’s . . . what is it? 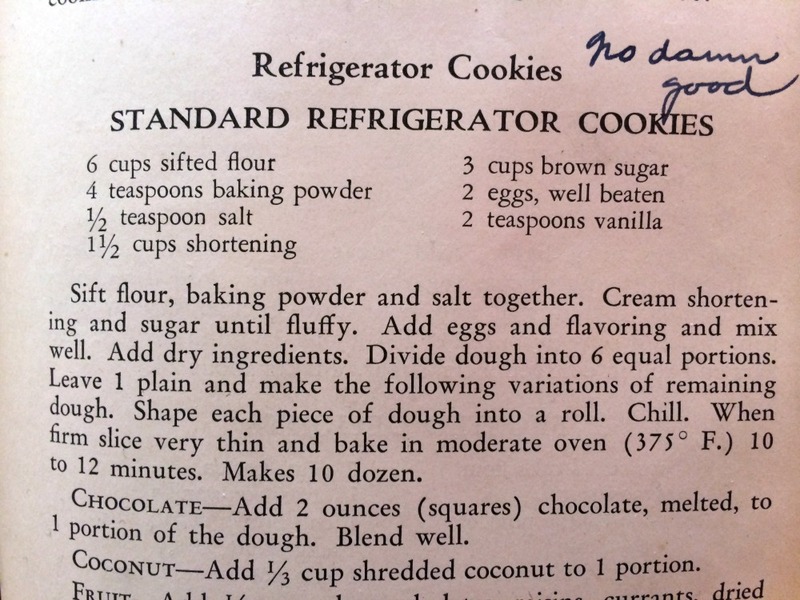 My grandmother disliked this recipe so much she took a fountain pen and made sure she’d never make the same mistake twice. It sounds simple enough. There are no weird ingredients or instructions. What could go wrong? I’m skeptical, so I cut the recipe in half. And I’m not making any variations. Less waste if it goes south. I won’t eat icing made with shortening (ugh!!!) so I won’t want to lick the beater after this creams. 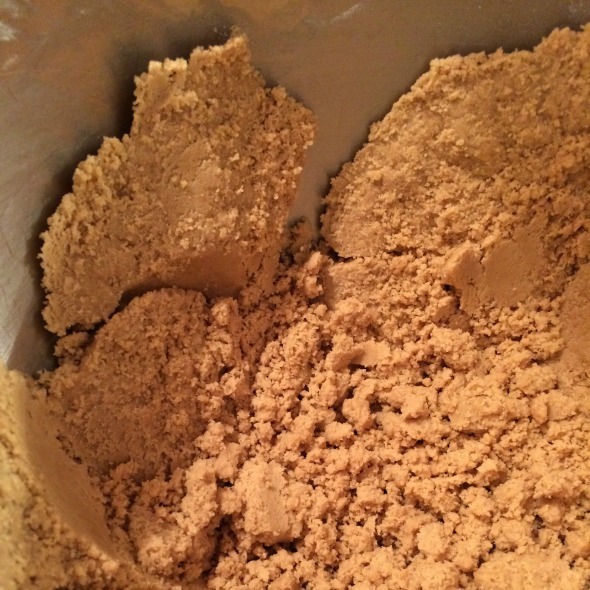 Mix in the dry stuff. More mixing. Isn’t this thrilling? 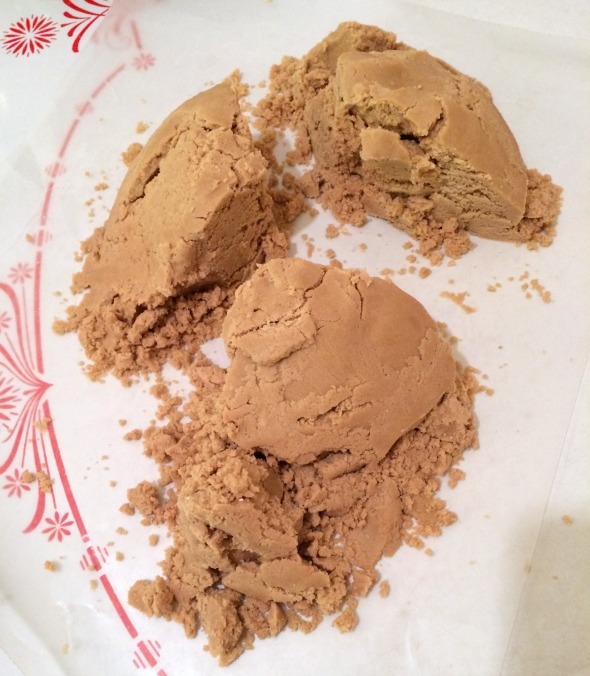 The finished dough has the look and consistency of slightly wet sand. But I’m not at the beach. I’ve seen graham cracker crumb crusts looking about like this. Maybe there is still hope. I tried to make rolls. Honest! But it wasn’t easy getting the dough to cooperate. 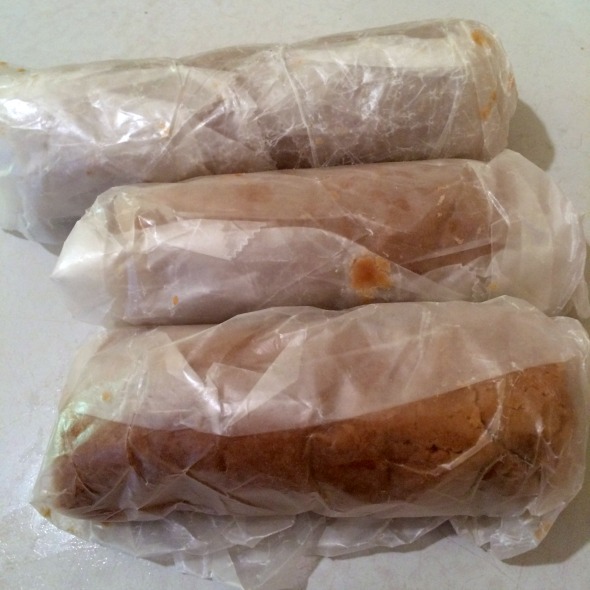 Waxed paper seems 1950s vintage appropriate for this recipe. After much man handling (woman handling?) they’re ready to pop in the fridge. ………………………… That’s a looooong interlude in which I go to bed, get up again and go to work. I took them out of the fridge. They had plenty of time to chill and hopefully congeal magically into cookie dough. Can I make “thin slices”? Heck no! She was right! This recipe IS “no damn good”! 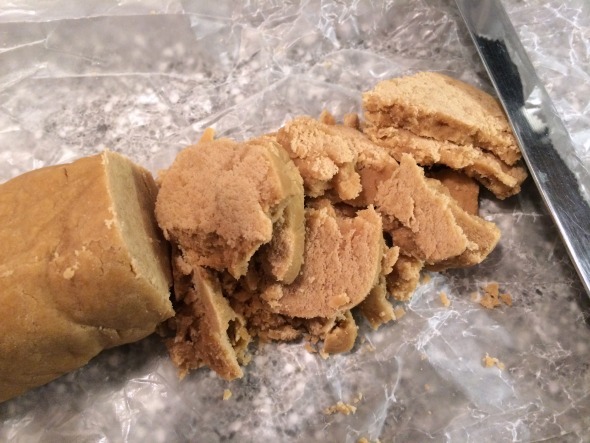 I turned off the oven and shoved all the crumbly “dough” into a plastic container in the fridge. 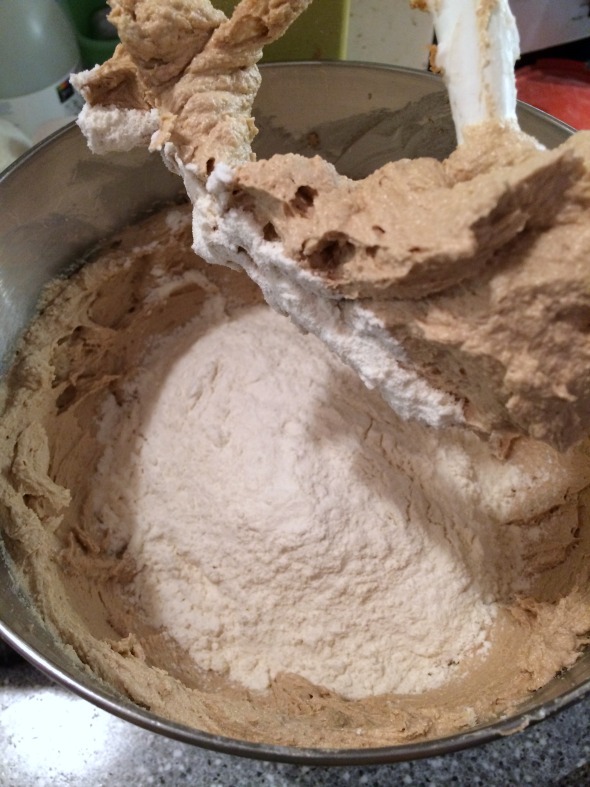 Can this dough be saved? How would you fix it? I have no idea how to save it, but I sure got a kick out of this post! I’m so glad you tried it. Now you know! Thanks for stopping by and commenting! I think I might have a crumble topping for pie or cobbler. 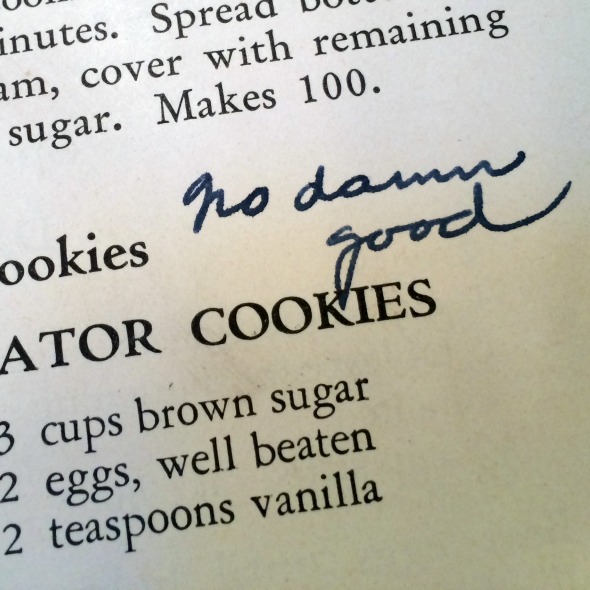 It wasn’t like Grandma to swear, much less to leave it for posterity in blue Scripto ink, so this recipe must be bad indeed! I shoulda learned from her mistake! This is so funny! I can just hear your grandma saying this. She must have been so mad at those cookies. I wonder if she tried them more than once. I told Joel he had to read it too. The only thing I can think to salvage them is, first to try one panfull as is. They might melt together with heat. If that doesn’t work I might try adding some butter, melted, just enough to make them stick. 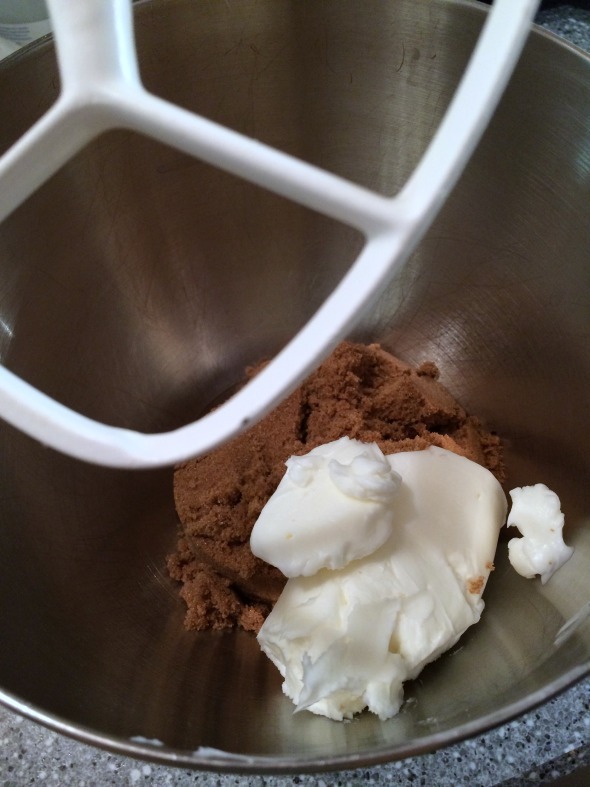 If I was to try the recipe again, I’d use half brown and half white sugar. Brown just does not cream well. You’re making my mouth water just thinking about that! It might work as a bar cookie. So that has double the flour and three more eggs than I used. Before I indulge the local pigeons I might try salvaging it. 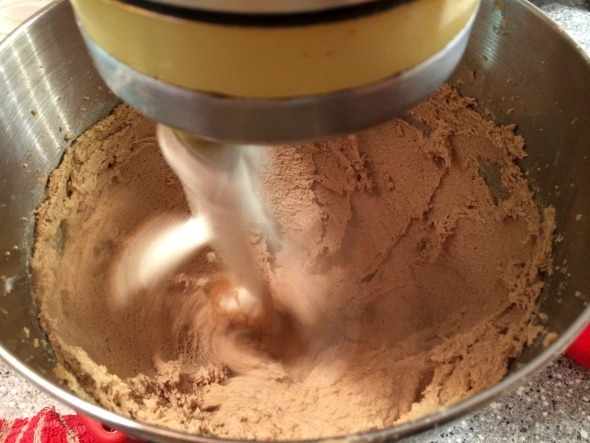 More kitchen mishaps that no one will ever post on Pinterest! That is the greatest comment and the “damn” just makes it classic. 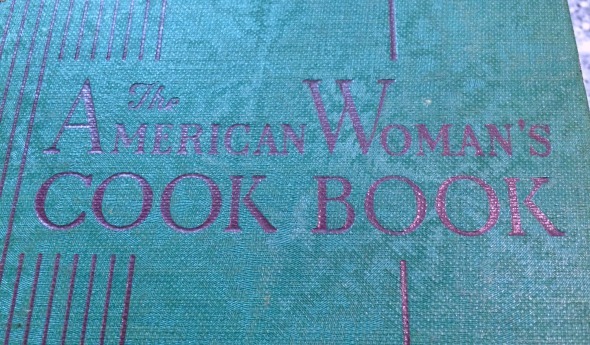 Can only imagine her frustration over a recipe that did not work. Definitely! It would have been a huge waste of ingredients if she tried the full recipe. I should have believed her! I can only imagine your Grandmother laughing and telling you “I told you so”.